It’s been pretty lonely setting up my new cottage, so yesterday I decided to have some friends over for lunch. 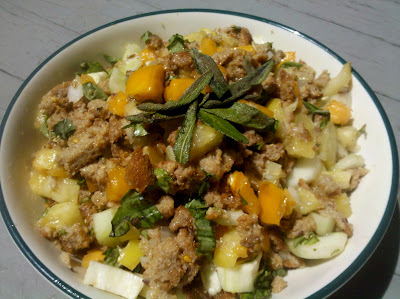 Katie, who had spent much of the summer in Florence, wanted to make a traditional Florentine salad called panzanella. She brought over fresh cucumber, tomatoes, and some Italian olive oil for the recipe. Unlike most salads, panzanella involves old, soggy bread. I lied and told her it sounded like a delicious idea. Shannon brought some kale to cook up with spinach and eat with tofu and a mixture of jasmine rice and farro: our backup plan in case the panzanella turned out to taste as gross as it sounded. Paul brought nothing, but he had spent the morning helping me build my bed frame, so he got a free lunch. We put on Foster the People (“Pumped Up Kicks” is my personal summer anthem) and got to work. 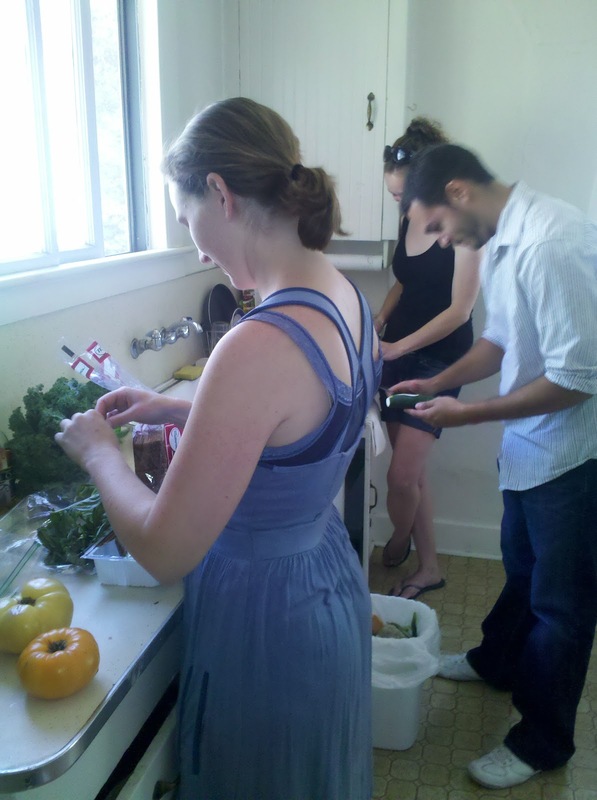 It was a totally bush-league operation, since I only have one cutting board and most of my kitchen things are still packed in random boxes, but group cooking is always fun. 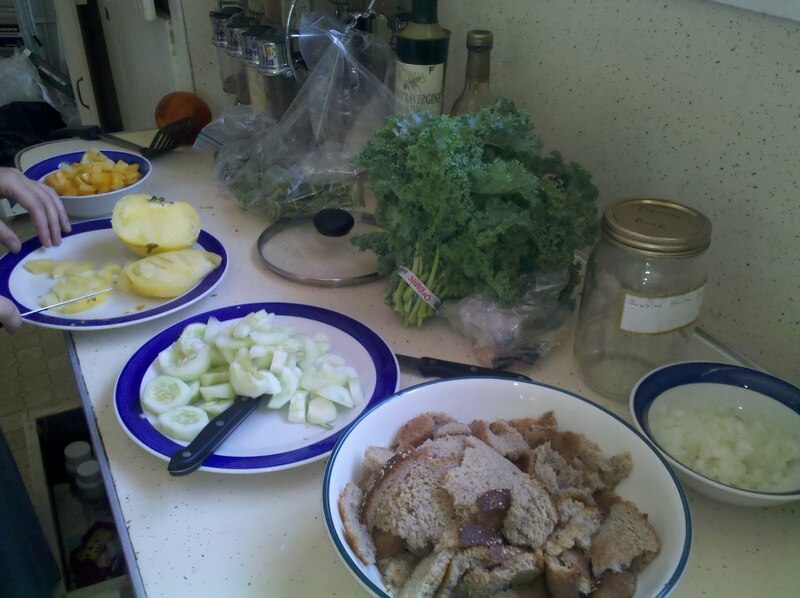 Here’s the recipe we used for the panzanella. The recipe for panzanella was invented to avoid wasting bread when it got stale. The Florentines would soak the stale bread, then wring it out and crumble it up with veggies. Unfortunately, I didn’t have any stale bread lying around, so we tried to simulate staleness by broiling six slices of my fresh bread in the oven. We had to be careful to make the bits like shreds rather than like bunches. Soggy bread is weird enough; little bunches of soggy bread is even weirder. 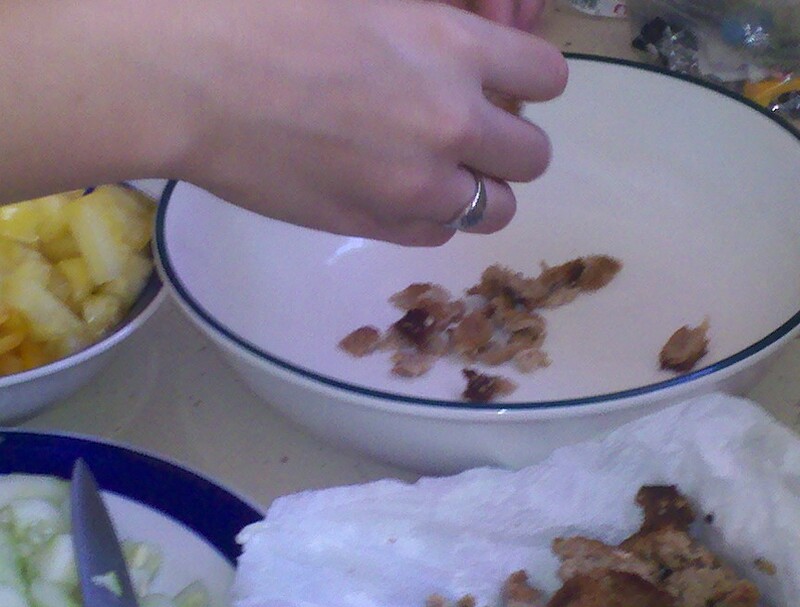 After the bread was shredded, we just dumped all the other ingredients into the bowl with it. When it was time to eat, we had to overcome the hurdle of my lack of table or chairs. It’s one thing for me to eat standing in the middle of my kitchen, but it’s quite another to expect three guests to do the same. So we decided to picnic on my front porch. The panzanella was really good! The bread gave it a density that most salads lack, so it was really filling. We ate the backup lunch, too, since it was made and all, but we really didn’t need it. Panzanella is definitely up there in my top ten favorite things that come from Florence, somewhere after opera and the Medici family. oooooh my!!! all your recipes and of course your photos of the dishes look so delicious, all with no exception! you are a great cook!